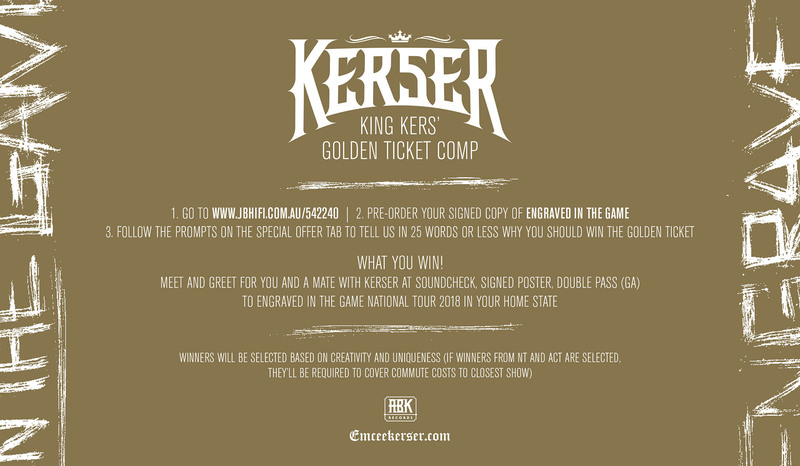 To find out where Kerser’s at, career-wise, you need look no further than the title of his latest and seventh album ‘Engraved In The Game’. “I feel because of the work I’ve put in prior, it’s definitely brought me longevity,” the C-town emcee who famously carved his own musical path, shunning traditional pathways and laughing in the face of national broadcasters enlightens. “It’s easier for me to stay relevant now, I can just post a photo on Facebook or Instagram and my buzz is back. My buzz is still just as crazy for the album as it has been in previous years,” he adds, before thanking his “heaps loyal fans” for remaining obsessed. After his usual frenetic pace of releasing a promo track every month, Kerser dropped his last promo in May and points out this “few months off” is the longest he’s had “in five years or somethin’”. But there’s a very good reason for this which he reveals within the album. He hasn’t played it safe, either. With Sinima in the producer’s chair for Kerser’s last two chart-topping albums (2016’s ‘Tradition’ and 2015’s ‘The Next Step’), the emcee “wanted to switch the beats up once again”. Enter Allrounda, a young producer from Cologne, Germany. 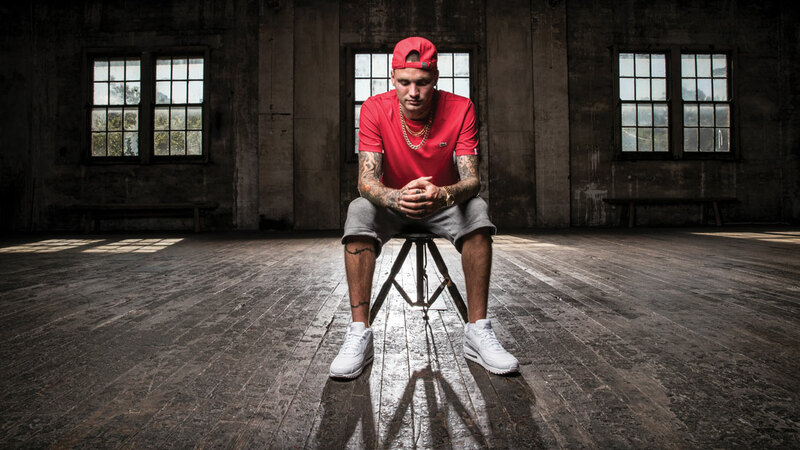 “I was a fan of his beats for years,” Kerser confesses. The pair emailed back and forth before Kerser reflects, “He caught the vibe that I was goin’ for with this album”. ‘Blessed One’ is the first single to be lifted from this album and Kerser describes it as “the perfect return”. “The vibe of the song is just so upbeat and it’s got a big chorus,” he extols. 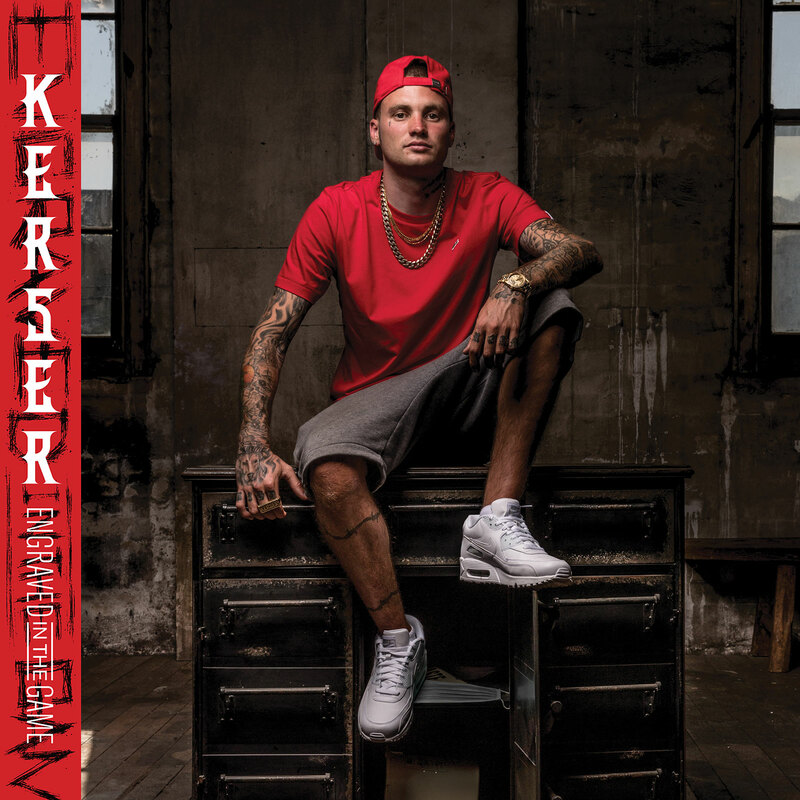 Heavy synths, sporadic beats and effervescent flourishes underscore this track, Kerser’s trademark percussive, inventive phrasing reminding wannabes, “I hustled it the right way,” during choruses. But his fame didn’t happen by accident, Kerser’s requisite “blood, sweat and tears” lining the road to success. But this lead single isn’t typical of the rest of the material on album number seven. Another standout track ‘Want Ya Now’ features Alicia Renee on the hook. “It just happened to perfectly line up,” Kerser marvels. “I had the story pretty much written, but I changed the last four bars to suit the chorus.” Haunting glockenspiel turns up the fear factor. ‘Airplay’ is a playful diss track definitely not suitable for radio play and would probably make Slim Shady blush.​’Engraved In The Game’ contains a lot of fresh instrumental elements, Allrounda an accomplished pianist. “The whole instrumental thing, it’s pretty exciting at the moment,” Kerser enthuses and piano, guitars and brass typically punctuate the flow. Kerser admits, “There was a lot of ideas thrown around for this album, we experimented a lot.” As well as producer Allrounda, Kerser credits his engineer Dave Petrovic at Electric Sun Studios for his contribution, saying, “We’ve really got three pairs of eyes overlooking the product”. The usual ABK Records suspects, Jay UF and Kerser’s brother Rates, supply guest verses. On Rates’ contribution ‘Line ‘Em Up’ Kerser tells, “We got the bridge at the end of that – that was [recorded] on the spot in the studio.” The Fortay-featuring album track ‘Slimy Game’ kicks off with a melodic beat that could soundtrack a chase scene. The plan was to “pretty much completely switch it up” on ‘Engraved In The Game’. “I don’t think the fans know what to expect, to tell you the truth,” Kerser teases. He says it best himself on ‘Until I Break’: “Still on top ’til the day that I quit.” There can only be one King and King Kerser is ‘Engraved In The Game’.